This would make a great gift for yourself or someone you know who may have served in the Seabees. You will not be disappointed. Seabee Accomplishments (Alaskan Sector, Iceland, united Kingdom, Mid Pacific, Africa, South Pacific, Atlantic Area, Sicily and Italy. Over 85 Photos on Approximately 83 Pages. 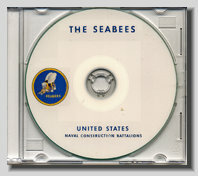 Once you view this CD you will have a better idea of what life was like for a Seabee unit during World War II.